Tag Archive | "Las Islas Malvinas"
The Falkland Islands. Las Islas Malvinas. Lo que sea. A tiny archipelago in the south Atlantic located – strategically? – 290 miles off the Argentinean coast. I would imagine that the almost 3,200 Falkland Islanders just want to be left in peace. In 1982, the Argentinean military junta – attempting to distract its people from the struggles at home – in invaded las islas to reclaim what Argentina felt was hers. Lady Thatcher, in an impressive show of military might, handily drove off the Argentinean forces and reclaimed the islands for the Crown. Thirty years later, tensions are still surprisingly high. The Falklands is an important foreign policy platform in Argentina; for example, it is not uncommon to see tattoos depicting the islands emblazoned with the Argentinean sun, flanked by blue and white. Politicians keep a tough stance toward Britain over the islands. As the thirtieth anniversary approached in December, the South American trading bloc, Mercosur, “closed its ports to ships flying the Falkland Islands flag.” This earned a British rebuke from Prime Minister David Cameron, calling the Argentinean reaction “colonialism.” The Argentinean Senate quickly condemned Cameron’s statement. The British, however, are disinclined to participate. Prince William recently began a six-week deployment as a search and rescue officer on the islands. Although the British defense ministry assures the world community that the Prince’s deployment is nothing but routine, the presence of a member of the British royal family on the Falklands has understandably inflamed Argentina. Additionally, the HMS Dauntless – Britain’s newest and most advanced destroyer – set sail for the Falklands on her maiden voyage. 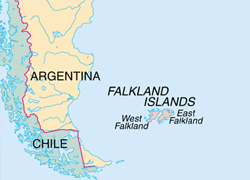 The former First Sea Lord, and Falklands veteran, Admiral Lord West did nothing to calm tensions by saying: “Should there be any foolish nonsense from Argentina, Dauntless can sit just off the airfield and take down any aircraft coming in.” Britain clearly has no intention of changing their Falklands position. Not wanting to be left out, the actor Sean Penn weighed in to support the Argentinean claim. He then implored the British to sit down with President Christina Fernández de Kirchner at UN-sponsored talks over the islands.